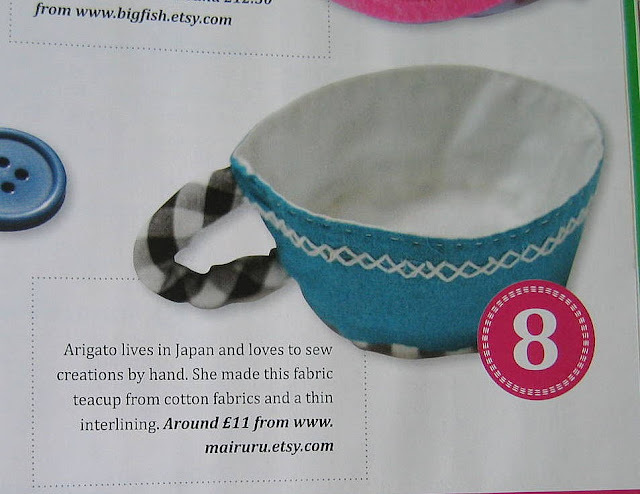 mairuru: My item is on an English craft magazine! 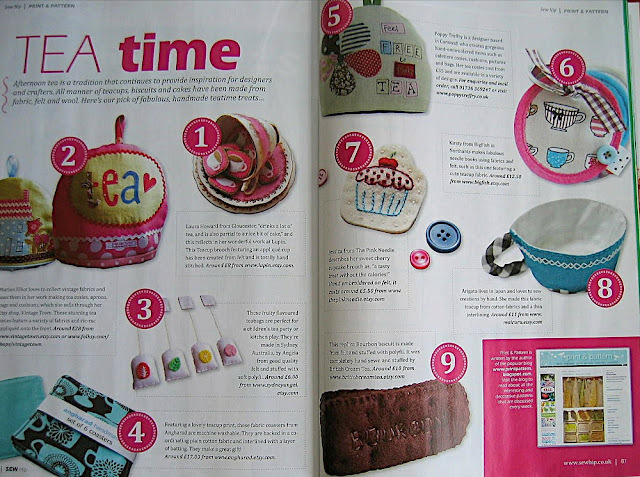 An editor of Sew Hip magazine sent me a message one month ago and my fabric tea cup is on it! It's the first time for me. Even if I cannot get the magazine in Japan, but I'm happy! So they wrote, "Arigato lives in Japan and loves to sew creations by hand.". Oh my goodness, congratulations! You must be so excited! Do you have a way to obtain a copy of this magazine for yourself? Congratulations on making the magazine! Funny they could imagine Arigato was your name! Your work definitely deserves to be featured! Well, all your friends and fans know it is you. congratulations!! So funny Arigato!!! I am happy they talk about your work, it is awesome! Ha ha, that's too funny. I wonder if anybody thinks my name is 'cheers'. Because that's how I sign off my emails. Hee hee. Congratulations, the teacup is super cute. Mai! I saw this too! I get this magazine in the mail! I was so thrilled to see your work in print! congratulations!!! I cannot get this magazine, but I'm OK with these pictures. I like the word "Arigato", so I'm happy with the misunderstood name! Thank you and have a good day for you all! I have just found your site and I am enchanted - your sewing is really beautiful and your ideas so much fun. I love the cloths you make and will be trying to do my own - but I am so used to machine stitching - I love that you do everything by hand, so i am going to try and learn to slow down! Lovely that you are in a magazine - you really deserve to have lots of success with your wonderful work! Take care! まいーさん！おめえとう！That is just crazy that they thought your name was Arigatou! Oh dear - I think the sub editor will get in trouble for this one! But congratulations! Your work is sooooo amazing! I love your onigiri pouches! They are amazing! I found out about your work on Three Buttons! So super lovely! I will come to Tokyo next month - can I buy your stuff from a shop there? WOW Mai COngratz!! So happy for you! Your soooo talented. :) And that mistake on your name is so cute made me giggle! Have a lovely merry happy day and love to you! Mai, ill check out the bookstores here and see if they have any here...if they do i will get a copy for you! Will let you know via email! I recently came across your blog and love it. I have read and finished with my copy of Sew Hip...would you like me to post it to you? If so email me and I will pop it in the post to Japan! I'm sorry but I sell my items only in Etsy shop. I don't have my shop here. I hope you enjoy your travel in Tokyo! There are many good fabric shops in cheap price! I already asked the copy to quiltygal, thank you so much! I'm really happy that many people help me. Thank you!!!!! Hello, Mai, I just visited your blog and discovered that your handmade product are lovely and nice...and Congratulation oh...^_^ Keep in up and cheers! おめでとう！You are so talented and I am loving your handmade goodies ever since I found your blog. Congratulations for becoming a published "crafter"...! Your creations are beautiful. Congratulations! I just found your blog and am in awe of your talent. Your handwork is so exquisite and cute. :) It looks like I will come back to visit often! I realized how happy I am from your comments! Congratulations..i just found your blog. Really love your creation. It's so funny that they thought you arigato..:) but the word is great!